Through an increased understanding of the association between HPV and cervical cancer, we now know that virtually 100% of all cervical cancer cases are caused by HPV. Because the vast majority of cervical cancer deaths could be prevented through HPV vaccination and cervical screening, targeted efforts in these two areas could realize the greatest impact for future incidence reduction. More Efficient HPV Screening: In collaboration with corporate partners, FHM field-tested a new screening assay to help “triage” high-risk cervical cancer cases in low-resource settings. Portable Colposcope: In collaboration with Duke University, FHM developed a new cervical screening tool (CerviScope) for use in reproductive health clinics where electricity is not reliable and funding is scarce. HPV Parent Acceptability Survey: In Haiti, awareness of and access to the HPV vaccine is minimal. For this reason, FHM is targeting efforts at increased awareness and assessment of parent acceptability of the HPV vaccine should it become available in Haiti. This research would inform the need for and the design of future HPV vaccination efforts. FHM screens and treats thousands of women annually who are HPV positive and would otherwise be under-served. The strength of our program rests on our collaborations with Haitian physicians, NGOs and corporate partners. 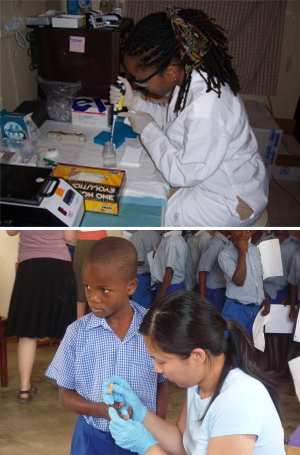 Human Papillomavirus Awareness in Haiti: Preparing for a National HPV Vaccination Program. Journal of Pediatric and Adolescent Gynecology, 30 (1), 96-101. PMID: 27498340. Gichane, M. W., Calo, W. A., McCarthy, S. H., Walmer, K. A., Boggan, J. C., & Brewer, N. T. (2017). FHM has engaged in varying strategies to improve the health status of Haitian families, with a targeted focus on women and children. Community Health Needs: In 2009, FHM set out to define healthcare needs in the Leogane community through individual interviews and focus group discussions. The intention behind this study was to identify perceived priorities of community women and give them a voice in the future building of the Leogane Family Health Center and program development. The most pressing health needs named by the women were accessible, available and affordable health care, potable water, enough food to eat, improved economy, employment, sanitation and education, including health education. Hypertension Reduction: Chronic hypertension is a significant global health problem that serves as a catalyst for a variety of health problems including stroke, kidney disease, blindness, dementia, heart disease and preeclampsia. The published literature on hypertension (high blood pressure) in Haiti is limited. Most hypertension studies include Black populations from the United States or Africa and the vast majority of existing Haitian data comes from Haitian communities living in Miami.Through FHM’s ongoing health care clinics and medical missions, we have learned that hypertension is a significant chronic health burden in Haiti. For this reason, we have initiated data gathering efforts in targeted communities in an effort to shine the light on this public health challenge. It is our goal to design health programs to facilitate improved chronic health management efforts. Healthcare Systems Mapping: In the summer of 2009, Family Health Ministries began a GIS mapping project in Leogane through the pioneering work of Duke graduate student Max Kligerman. The purpose of this research is to develop a better understanding of the community’s health needs by mapping and gathering data on clinics, schools, and church locations. This data was unprecedented for the community- no maps of Leogane had ever been made before. Thus, five months prior to the earthquake we had a precise spatial understanding of the community’s healthcare system. When the earthquake hit Legoane in January, 2010, FHM found itself in a unique position to understand the precise effects of the earthquake on the community.In January 2011, Max returned to Leogane to conduct a one-year post earthquake re-mapping analysis of the status of healthcare providers. The results demonstrated that of the 34 clinics functioning prior the earthquake, 29 of these clinics were still functioning one-year after the earthquake (many of these clinics had moved locations though due to damage or collapse). Eight new healthcare providers, many foreign, had also emerged since the earthquake. Our findings suggested that medical services in Leogane were generally more accessible and of a higher caliber than they were before the earthquake. This information will be used by FHM to target future collaborations for expanded cervical cancer screening and chronic health care services. Breastfeeding: Family Health Ministries breastfeeding research efforts are focused on increased awareness of the well-documented benefits of breast-feeding to maternal and child health, including: reduced incidence of diarrhea and respiratory infections among infants, and increased birth spacing for mothers. FHM also seeks to better understand the natural and cultural barriers which impede exclusive breast-feeding for the first 6 months of life. During the Summer of 2014, DGHI Master in Global Health student Lauren Zalla, will investigate the effect of maternal malnutrition on the ability of mothers to breastfeed. FHM hopes to use the findings of this study to inform policymakers, healthcare workers and community members of the effect of maternal malnutrition on breastfeeding in Leogane. Specifically, this study will address whether a focus on breastfeeding education alone is sufficient in places where maternal malnutrition is prevalent. Contraception/ Birth Spacing: Birth spacing refers to the time interval from one child’s birth date until the next child’s birth date. There are many factors to consider in determining what is an optimal time interval between pregnancies. These factos are very important in the health and welfare of both the mother and her children and are often tied to the nutritional status of the women’s existing children. The contraception practices in the Haitian community will greatly affect the interval between children.Family Health Ministries aims to define these practices in the Leogane community. We have gained knowledge in the area of existing strengths and challenges of the community family planning programs. This information will be used to develop culturally appropriate maternal health programs in the future. These studies were executed by two Duke Global Health Masters Students, Dr. Nahida Chakthoura (Summer 2011) and Fan Yang (Summer 2012). Birth Attendant Education: Approximately 85% of births in rural Haiti are attended by family members or traditional birth attendants (TBAs). Worldwide, 53% of TBAs have no formal training and the remaining 47% have some training, with the amount and quality varying considerably. Haiti’s maternal and infant mortality rates are the highest in the western hemisphere. The leading causes of maternal death in the developing world are hemorrhage, obstructed labor, infection, complications from abortion, and preeclampsia, and 37% of the deaths in children under 5 happen during the neonatal period, primarily from asphyxia and tetanus. Through FHM’s partnership with midwife Marnie Cooper Priest, a TBA training curriculum was developed, translated to Creole and taught to TBAs in Fondwa. The results of this research were very promising in the positive outcomes realized for participants and the women that they served. The results of this study are being developed into a manuscript, and we hope to further expand and refine the curriculum through research grants and/or donations. Family Health Ministries conducts its Haiti-based Institutional Review Board at least twice annually, in addition to United States-based Institutional Review Boards (IRBs). The IRBs convene to protect the rights of research subjects.